Dr. Vincent Hau remembers the first time he ran a timed marathon. He had been training for months and had completed shorter races in Tuscon, Big Sur, New York, and Chicago before attempting the 2014 Boston Marathon. Nearing the finish line of that race, Hau saw something he said he would never forget: a blind runner, weaving through other participants, being led by a guide. "The image stuck with me," Hau, a doctor specializing in vitreoretinal (vision-related) diseases, told NBC News. "I work with people who are visually impaired, but I'd never seen anything like that. I was so inspired that I ended up running my personal best." The Southern California-based marathon runner is now a full-time father, ophthalmologist, and retina specialist at Kaiser Permanente Riverside Medical Center. Hau's career interest in medicine stemmed from his devotion to family. His Chinese father and Vietnamese mother immigrated to the United States as refugees after the fall of Saigon, Hau said, sacrificing all they had known for a better life and opportunities. Hau remembers the tight-knit Asian-American community in Tucson, Arizona, where the family settled. "I had an instant connection with anyone who looked like me at school," he said. But when he went off to college, studying biochemistry at the University of Arizona, the aspiring physician's eyes were opened when it came to community. While a student at the university, Hau said he held several leadership positions and became deeply involved with advocacy work along with his medical studies. He served as a board member of the Tucson Pan Asian Community Alliance and the Asian Pacific Islander American Health Forum, volunteered for the UofA Cultural Resource Center, and joined the Chinese American Citizens Alliance as national conference coordinator, discussing issues of ethnic discrimination and empowerment. “The best person to advocate for your issues of importance is yourself, because no one else understands your situation better than you,” Hau said. While in medical school, Hau also started a chapter of the Asian Pacific American Medical Students Association — of which he later became national president, developing programming to help medical schools with API health disparities. "We supported and collected a database of [health-related] incidents of South Asian discrimination, in the wake of 9/11," Hau said. "As Americans, I believe we are fortunate to have the chance to seize opportunities. We have to take an active role in society, to ensure that our families and friends are protected, not forgotten." Wanting to be a campaigner for the community and to make his family proud, Hau threw himself into neurology research and ophthalmology rotations, earning both his M.D. and Ph.D. in 2005, he said. He achieved his goal of becoming a surgeon, and went on to start several private practices in Southern California before joining Kaiser Permanente in Riverside, California, in 2013. "I always liked Kaiser's total body wellness approach — the concept of 'thrive,' leading a healthy lifestyle through mind, body, and spirit," Hau said. While in medical school, Hau had let his physical health lag, he said. Driven by Kaiser’s values of balance and wellness, he set his focus on running again. "Running is a way for me to challenge myself through dedication and discipline while enhancing my physical fitness,” Hau said. “I enjoy the feeling of accomplishment and satisfaction after I've run a great workout. It's not just physical, but also the mental challenge of overcoming your brain screaming at you to stop, and you realize your full potential." After seeing the blind runner at the 2014 Boston Marathon, Hau's community advocacy skills from college returned. The next year, the surgeon participated in the Boston Marathon once again, this time as a guide of blind runner and marine Richard Hunter. The two were paired by the Massachusetts Association for the Blind & Visually Impaired, Team With a Vision, which was founded 24 years ago. "My goal is to provide for as many a sense of hope...through the latest medical treatments, research or surgery; through listening to their stories and being a source of support, and running alongside them as their guide," Hau said. "I've dedicated my life to helping the visually impaired, treating them with my knowledge in the operating room. I now work with them on another level — through emotional support and friendship." 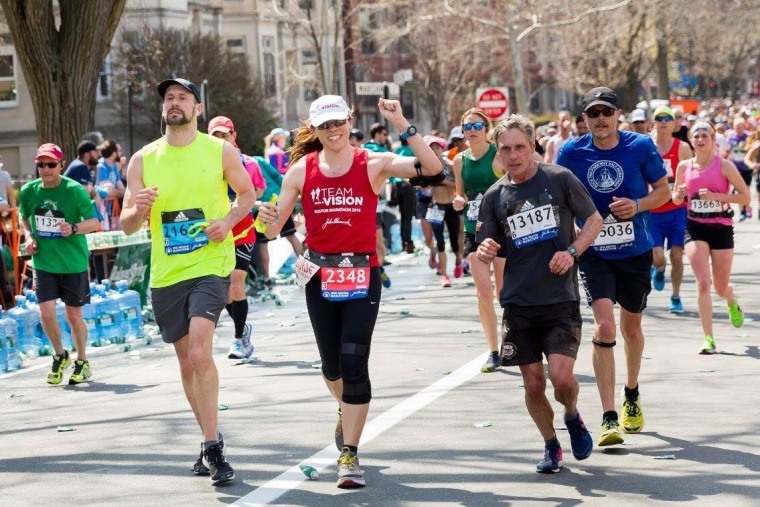 Hau has since accompanied blind runner Thomas Panek, president and chief executive of Guiding Eyes for the Blind (a nonprofit that provides visually impaired runners with guide dogs), in several races including Boston and New York City. In March 2016, Hau also helped guide Jason Romero — the first and only blind person to run across the United States — on the first leg of his cross-country from Santa Monica to Boston. Today, Hau continues to run in marathons varying from Disneyland (with his 20-month-old daughter) to Sacramento, acting as a guide for blind runners, and advocating for the communities he feels so closely tied to. Aside from personal goals as an athlete, Hau hopes to start an ophthalmology clinical research program at Kaiser Permanente Riverside. "I try to take advantage of opportunities that may put me in situations to challenge me to learn something new, or [out of my] comfort zone,“ he said. “I stay motivated by drawing from the energy of these amazing people I get to meet and run [with]." Follow NBC Asian American on Facebook, Twitter, Instagram, and Tumblr.